Since the introduction of the GI-MAP in 2015, Diagnostic Solutions Laboratory has established itself as the leader in the field of qPCR technology and gastrointestinal evaluation. 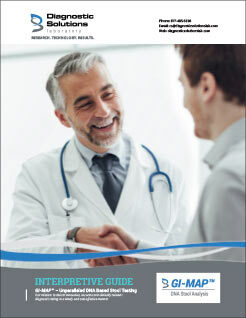 Now, we are pleased to offer a clinical Interpretative Guide that goes beyond reporting results. The GI-MAP Interpretative Guide includes detailed information about all tested pathogens, describes the nature and impact of organisms found in the microbiome, and includes specific recommendations related to dysbiosis and intestinal health. Download or print the Interpretative Guide and use it in office visits, when evaluating test results, and as an overall guide for deciding when therapeutic intervention is needed. In the last few decades, DNA analysis has transformed the field of GI testing. More than ever before, we are keenly aware of the health benefits and disease risks brought about by the microorganisms that inhabit the GI tract. The GI Microbial Assay Plus (GI-MAP™) uses state-of-the-art qPCR technology to assess a patient’s microbiome from a single stool sample, with particular attention to microbes that cause disease or that disrupt normal microbial balance and contribute to perturbations in the GI microbiota and contribute to illness. Read the GI-MAP White Paper and learn the science behind how DNA analysis can help your patients with gastrointestinal related symptoms. 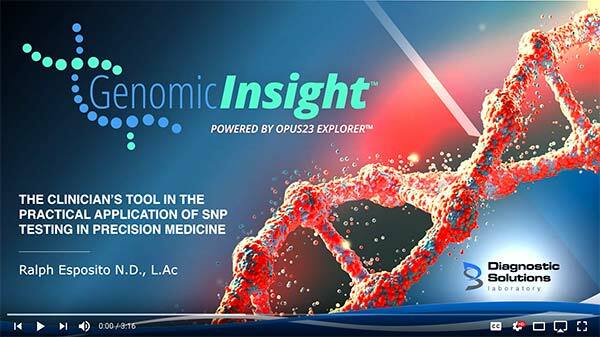 We've started putting together a playlist of video modules for learning how to use GenomicInsight™. Stay tuned as we populate the feed in the weeks to come! Concepts of molecular mimicry, the hygiene hypothesis, intestinal hyper-permeability (leaky gut syndrome) and aggressive use of predictive antibody testing are explored in this article with examples given on how emerging information on these phenomena may aid the clinician in a new, more proactive, approach to management of these conditions. Alterations in gut microbiome have been associated with metabolic diseases such as obesity and type 2 diabetes; however, the changes in bacteria species or genomic composition are not clear. If you have Celiac Disease, or non-Celiac gluten sensitivity (NCGS), but are still having villi damage or residual symptoms, you may still be getting gluten exposure from hidden sources, including non-dietary sources. This comprehensive list will help you identify potential exposures that you weren’t aware of.